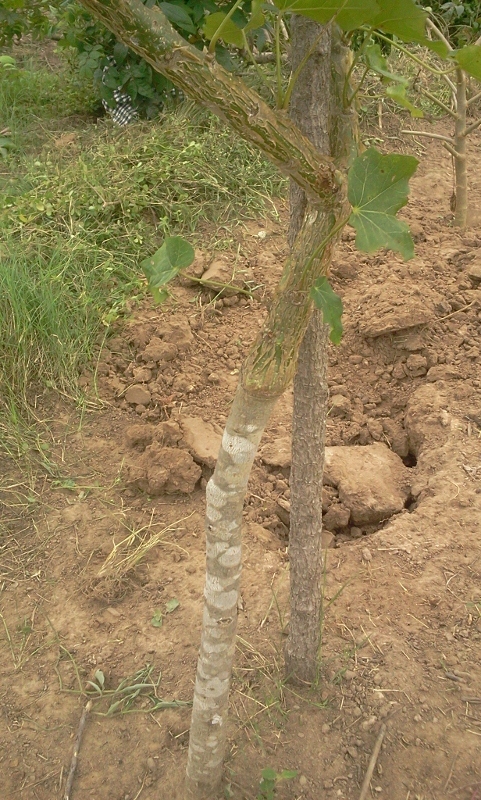 We wrote about the role of grafting in Jatropha development before. Today we return to a grafted plant at our test farm. It is almost 3 years old and standing strong. When we created it a random scion was cut from one of our standard field plants and grafted on a cut Jatropha gossypifolia with kind of a reverse cleft graft. 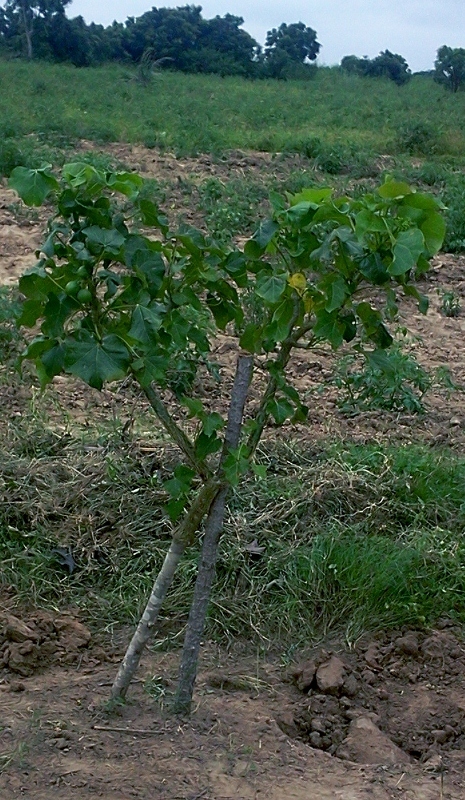 A main property of this grafted plant is an immensely increased drought tolerance compared to Jatropha curcas samples in the vicinity. The stem appears slightly thinner (it’s on the left side in the picture. The main stick in the center is a support because the plant is exposed to constant strong winds), but is developing. We have added another interesting picture which indicates clearly the different textures of the stem below and above the graft. More expertly done the graft would probably be closer to the ground. It should be noted that this plant suffered from heavy mealy bug attacks lasting for almost 18 months. Development basically came to a halt during this period. The plant exhibited above average strength in surviving the attack and was one of the first in the area which recovered and started flowering and fruiting again. The earlier article discussed in detail the potential of grafting for accelerated farm development and recovery of suspended Jatropha projects with future elite cultivars. At Bionic Palm we see great potential in such an approach and keep experimenting with it while we move along with our hybrid breeding program. Thanks for documenting and publishing your very diverse experiences ! What I think may be the case is some mild incompatibility of the scion, as evidenced by the swelling. It will be interesting to follow this up. In fruit trees – if it becomes problematic – such is overcome by an intermediary graft (a triple chimaera; 2 for the stem, one for the canopy). Paul, what looks like a swelling is rather the result of a very amateurish procedure done by myself. Literally this was the very first graft of my life! A couple of other samples we did with the same combination never showed any "swelling". I think this combination is 100% compatible.